Be the first to share your favorite memory, photo or story of Kathleen. This memorial page is dedicated for family, friends and future generations to celebrate the life of their loved one. 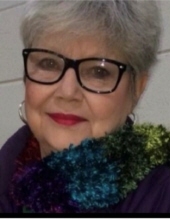 Kathleen J. Weber, 76 of Knoxville, TN passed away on December 22, 2018, after a courageous battle with ovarian cancer. Kathy was born in Waukesha, WI on February 8th, 1942. She graduated from Catholic Memorial High School and had a successful career of 45 years as a professional hairstylist. Kathy is survived by her brothers and their spouses - Jim & Joanne Knoebel of Eagle, WI and Dave & Rosie Knoebel of Maquoketa, IA. She is also eternally loved and will forever be missed by her three children, Steve Ollenburg & his wife Robin of Cypress TX, Krista Scott & her husband Mike of Ft Myers, FL, and Heidi Webster & her husband Tommy of Knoxville, TN. Kathy served as an amazing inspiration and source of love to her children as well as all seven of her Grandchildren and three Great-Grandchildren. Kathy is preceded in death by her parents, Gene & Avis Knoebel of Waukesha, WI and her husband of fifteen years Bill Weber of Ft. Myers, FL. Mom, you are loved “To the Moon and Back a Thousand Times”! To send flowers or a remembrance gift to the family of Kathleen J Weber, please visit our Tribute Store. "Email Address" would like to share the life celebration of Kathleen J Weber. Click on the "link" to go to share a favorite memory or leave a condolence message for the family.